Key Takeaway: Nothing of worth comes easy, and always entails time, effort, and evaluation. The same holds true for true and purposeful living, which is the worthiest of worthy things. It is always gradual and step-by-step: What matters is you keep stepping forward. In the bestselling novel Memoirs of a Geisha by Arthur Golden, we are treated to a scenario typical of Asian society. The eponymous geisha, Nitta Sayuri, did not start out as a geisha immediately. In fact, she began as a maid, then as a student, then as an apprentice geisha, and only then after overcoming a particular milestone did she become a full-fledged geisha. Even then, things didn’t stop: She mentions that even the most senior geisha take advanced dance lessons well into their senior years. It’s a never-ending journey for them as they continue to learn, to practice, to perfect. And so is true living. For most “successful” people, their achievements weren’t overnight. I use “successful” in quotation marks because our definition of success in The Daily You is quite different – it’s less self-centered and more substantial. But more on that next week. 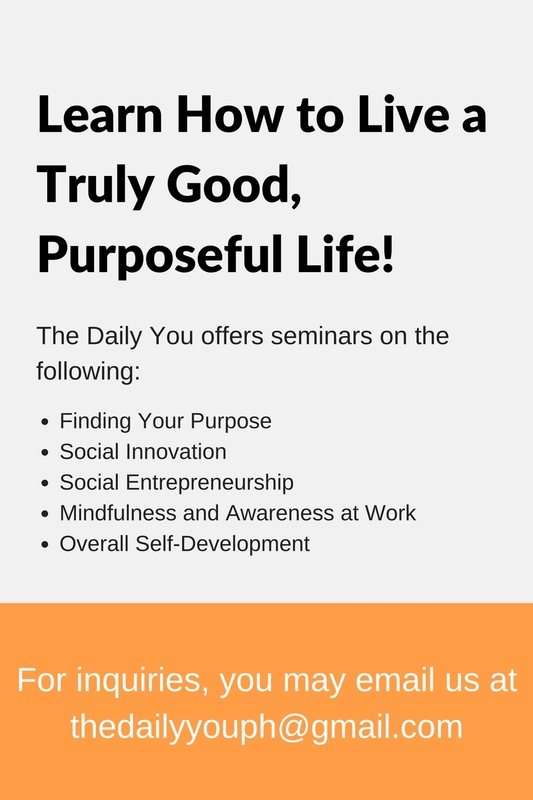 To say you are living a truly purposeful life is quite a mouthful and very arrogant – even though that’s TDY’s goal for as much individuals as possible. The thing is, we never really can say we are living such a life. We can only say we try to do so as much as possible. And, like the career of a geisha, it’s a journey. It’s no ordinary journey; it’s a lifelong journey. We never really “get there” until we die and see, in the afterlife, the results of what we have done. As many spiritual philosophies teach, the earthly life is a pilgrimage, and here at TDY, we believe that the pilgrimage is towards the nirvana of achieving your purpose. On the other hand, purpose isn’t just something achieved; it’s something lived everyday – hence, The Daily You. This means that our goal is both to live and to achieve true living. That’s why it’s always gradual, step-by-step, and never sudden or a one-time thing. True living is a work in progress – and the very crux of it, of continuous learning and experiencing, is what makes life truly good and joyful. The fact that life is meant to be taken step by step implies that you can take a step forward, a step sideward, or a step backward. Or even a brief – but hopefully not long or permanent – breather. The point is that you step. The question now is, where? In what direction? Sometimes it’s even okay to move sideways or backwards, if and only if it helps you move even more forward eventually. Otherwise, it’s a waste of your time, your energy, and your purpose. The key to this is to think in the long-term and the big picture: How is your overall progress? How have you journeyed since time immemorial? If your reflections on this yield favorable results, no matter how little, you are on the right track. Otherwise, you might have to move sideways – to change your life course, perhaps. Or to change the way you think or act. Actually, that was a learning I got recently, although I no longer remember where: Are you even just one step higher today than where you were yesterday? It would be amazing if we could move up a hundred steps everyday, but as mentioned, because purposeful living is a constant work in progress, a step or two up the ladder everyday would be more realistic – and more in line with the lifelong and long-term perspective that higher purpose naturally entails. After all, nothing of worth comes easy, and always entails time, effort, and evaluation. So, this weekend, we invite you to look back and see how your journey of living has been. Continue to move forward, step by step, always mindful and in sight of your goal! Tags: gradual, higher purpose, long-term, Purpose, The Daily You, Today. Bookmark the permalink.